Even the most glamorous eye makeup will never be complete if your eyelashes lack the touch needed to also make them beautiful. Lash beauty is an important part of overall facial beauty. Long beautiful lashes focus attention to your eyes and create unique attractiveness. This is why so many women dream of having longer eyelashes like they see in the magazines. Unfortunately not everyone is blessed with thick, long eyelashes. But there are many proven methods to help make you lashes and thicker. There is no need to spend hundreds of dollars on mascaras that actually dry you lashes and make them look unhealthy. 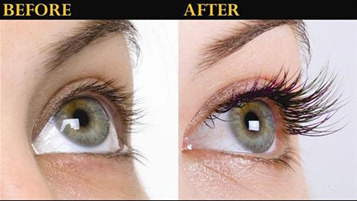 Now days it is actually much better, and much cheaper, to grow your lashes naturally with new lash growth products. Here are also several other secret tips that help boost eyelash growth. Using a special lash comb, brush your lashes gently. This is the easiest way to make your lashes look longer. Regularly combing your lashes is a good practice. For beautiful lashes it is important to properly care for your eyes and the area around your lashes. Even if you try all these tips, if your eyes are not cleaned and care for you will never have that full beauty look. Be sure you completely remove your eye makeup and moisturize before going to bed. Many natural oils including coconut oil, olive oil, castor oil and jojoba oil are the oils that are commonly used for making eyelashes grow longer. These oils can work wonders when used regularly on your eyelashes. To see the best results, make sure you apply them regularly. Natural oils contain minerals, vitamins as well as lengthening agents that whelp make eyelashes longer and also moisturize your lashes. This old age trick has worked for many women and it’s a simplest and quick way to promote eyelashes growth. Use a mascara brush or cotton stick for applying a Vaseline swipe on your lid before going to sleep. For faster results, you might also try taking vitamin E supplements. Take one every day. Also, vitamin E lotion can help your lashes to achieve maximum growth. Today, some enhancement mascaras also contain lash accelerators. Apply just one coat of these mascaras twice a day can help growth your eyelashes. These products are a bit more expensive but do create longer lasting results. These lash-growing products have been specifically made to promote the growth of your own lashes using all natural ingredients that do not require a prescription.